THE enemy of every champion sporting side - a fear of failure - will drive the Kangaroos to produce their best against underdogs Samoa in Sunday's Four Nations Test at Wollongong's WIN Stadium. And they will need their very best, with the Samoan players gifted an opportunity for glory and a place in their nation's sporting history should they pull off what would be a massive upset and a chance to play in next weekend's final in New Zealand against either the Kiwi hosts or England. If New Zealand beats England today, then it opens the door for Australia or Samoa to make the final. An England victory would kill off Samoa's finals chances but the chance for it to beat Australia and claim its biggest sporting triumph would not be diminished. Australian needs a big win to guarantee it defends its Four Nations title. Given the build-up and two disappointing performances with an under-strength side packed with rookies, national coach Tim Sheens would be expecting them to click on Sunday. Both New Zealand and England, even though the English lost, attacked Australia through the middle with their superior size and physicality, an area Samoa won't shy away from with its size advantage. Sheens, who has tried two different front-row combinations, has given Canberra's Auckland-born Josh Papalii his big chance to step into the front row in the most pressurised Test Australia has faced in years. 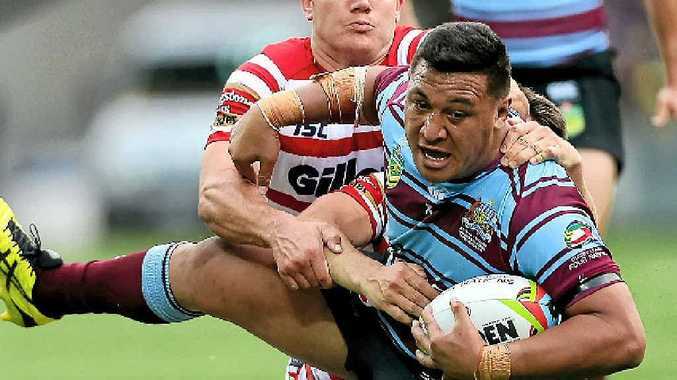 "I'm pretty pumped, excited and nervous," said Papalii, who links with Wests Tigers prop Aaron Woods who must get the upper hand and take Australia forward. Frank Pritchard, Isaac Lui and captain David Fa'alago will muscle up in the middle, along with Brisbane's Josh McGuire, who has been outstanding playing lock for Samoa during the series. They present a dangerous proposition for Australia, which has been off its game so far despite the efforts of senior stars, skipper Cameron Smith, halfback Cooper Cronk Greg Inglis, and Greg Bird to guide the inexperienced players through. If Australia eliminates the uncharacteristic errors which have marred its two performances so far, it should be too strong for Samoa which has been incredibly brave in its two narrow losses so far. Having not missed an international final since 1955, the fear factor should get the Australians home.